I’m sure you’ll agree with me that quads can be the most difficult muscle group to tackle. These muscles are located in the front of the upper thigh, and building strength in this area has numerous advantages. 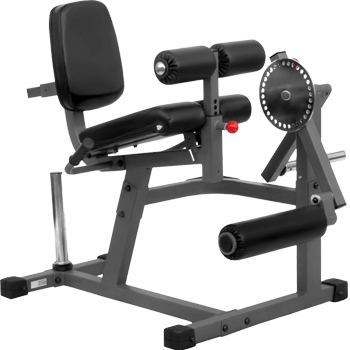 In this post, we’ll go through various aspects of the leg extension machine and understand how you can harness this piece of equipment to build rock solid quads. Leg extensions are performed using a leg-extension machine, and they are meant to target the quadriceps muscles. A leg extension machine is a piece of equipment that is classified as a resistance training device. It comes in various shapes and sizes and is manufactured by a number of brands. Today most gyms and fitness centers have a leg extension machine or two. This move involves sitting in a chair and lifting a weighted bar using your quadriceps muscle. It is important to note that while the leg extension machine targets the legs, it does not offer a total leg work out like squats or deadlifts. Among leg extension machines, the level leg extension machine is the most popular. Using a leg extension machine to build your quads has its own advantages and disadvantages. What are the Risks associated with Leg Extension Machines? The Force USA Leg Extension/Curl Machine is a professional quality device which is suitable for home use. It is a reliable, practical, compact, heavy duty piece of equipment. The seat and pads are made from high-density foam padding, wrapped in rip-proof upholstery. An added bonus is that it comes with a Lifetime Structural Warranty. 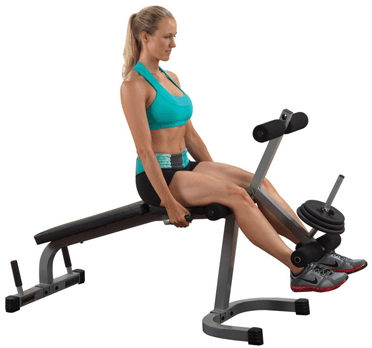 The Body-Solid Pro Dual Leg Extension Leg Curl DLEC-SF is an excellent piece of equipment to develop your hamstrings. It has a biomechanically accurate pivot point to ensure that you get a safe and efficient workout. It comes with an adjustable back pad that is suitable for any user and does not place stress on the back. The pop pin footpads ensure proper alignment, and the thigh pads offer stability. It is a versatile piece of equipment that gives you the ability to perform 2 important leg exercises from one position. The Valor Fitness CC-4 Adjustable Leg Curl Machine allows you to perform both curls and extensions while being seated in the same position. It has an easy to use sundial adjuster to increase the range of motion. Depending on the height of the user, the foam back seat can be adjusted to position the legs optimally. The thigh support rollers can also be adjusted during leg curls to apply pressure on the legs. The weight lever arm supports both Olympic size plates and standard size plates. 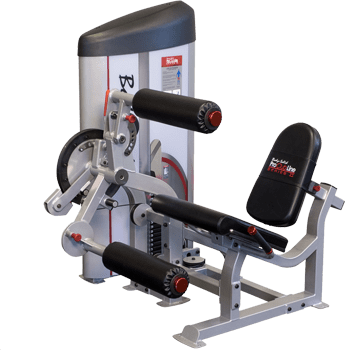 While the Inflight Leg Extension Machine has a compact design, it still allows you to perform a wide range of exercises targeting your hamstrings and glutes. It is fitted with a roller pivot and automatically adjusts itself to provide greater ankle comfort. It comes with comfortable seating to protect your back. The frame and weight plates have a lifetime warranty, and there is a 1-year warranty on moving parts. This Leg Extension Machine is on the pricey side. 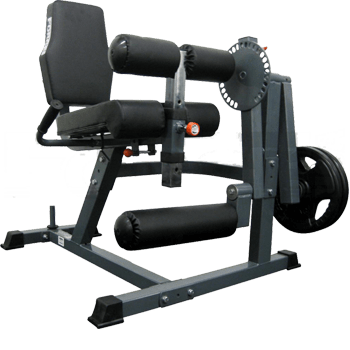 This Rotary Leg Extension and Curl Machine from XMark provides a full workout for the hamstrings and quadriceps by isolating these muscles while providing a full range of motion. 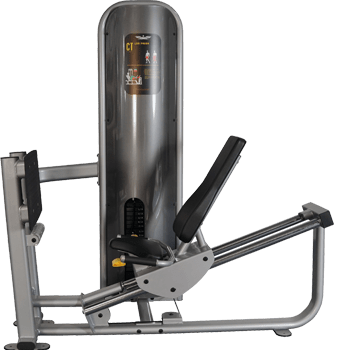 It is a high-end leg exercise machine that comes with a fully adjustable backrest, 20-position adjustable press arm, and a 12-position adjustable thigh pad. It can be used with standard and Olympic plate weights. A chrome Olympic adapter sleeve is included, and rubber handlebars are provided for grip. The frame is bolted on skid resistant feet for added stability. Are leg extensions necessary? Leg Extensions are an excellent way to work the quadricep muscles which run along the front of the thigh from the pelvis to the knee. These are responsible for knee extension and hip flexion. Leg extensions isolate this muscle and focus on making it stronger, by contracting it to bring your knees up working against the weight. Since you don’t need to be too particular about form and posture, leg extensions are a great machine-assisted option for beginners. Since leg extensions are an isolation exercise for your quadriceps, they focus on strengthening the quad alone while fortifying the quadriceps attachment for the knee and the patellar ligament. While doing total leg exercises such as squats you tend to expend a lot of energy. Leg, extensions allow you to focus on target muscles more selectively. Leg extensions are a great way to finish your workout after performing compound exercises like dead lifts or squats. As with any other form of exercise, it is important to maintain proper form when performing leg extensions. The first step is to choose your weight and sit on the machine with your legs under the resistance pad. Point your feet forward and hold the side bars with your hands. Adjust the pad so that it is positioned just above your feet on top of your lower leg. There should be a 90-degree angle between your upper and lower leg. This is important as undue stress can be created at the knee joint if your knees are over your toes. When you start exercising, make sure that you stop pushing further once you hit the 90-degree angle. As you exhale, extend your legs to the maximum using your quadriceps. Hold this position for a few seconds while keeping the rest of your body stationary on the seat using your arms. As you inhale, lower the weight back to the original position slowly, ensuring that the gap does not go beyond the 90-degree angle limit. Repeat this motion for the recommended number of times. Any device that requires you to use your quadricep muscles to lift weights is a good replacement for leg extensions. You can get a similar workout at home by sitting on a chair and attaching weights to your ankles or using resistance bands. Walking backwards on a treadmill or reverse step up can also deliver similar effects and are good Leg Extension Substitutes. To maximize stimulation of various thigh areas, you can use different foot positions. Another variation is to perform the movements one leg at a time instead of lifting both legs at once. By straightening your legs against resistance using a leg extension machine, you are working the muscles in the front of the leg. Quadriceps: The quadricep muscles are made up of the vastus lateralis, the vastus medialis, the vastus intermedius, and the rectus femoris. These are responsible for flexing and extending the knee. The rectus femoris is the most worked muscle during leg extension workouts. When your knee is almost straight, the vastus medialis then contracts. Calves: The gastrocnemius and the soleus are the two muscles that make up the calf muscle group. The gastrocnemius which is close to the skin is the one that is worked the most during a leg extension. This muscle also assists the hamstring muscles in bending the knee when using a leg extension machine leg curl. Hamstrings: Your hamstring muscles contract to bend your knee when you perform seated leg extensions. Three muscles— the semimembranosus, the semitendinosus and the biceps femoris— make up the hamstrings. The biceps femoris is the largest of the three, which is used the most when using a leg extension machine. 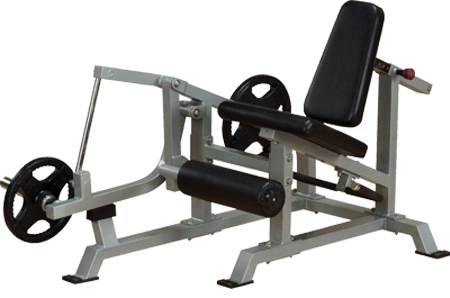 Good quality leg extension machines come with a weight stack included, and these are known as a selectorized seated leg extension machines. The plates come in additions of 10 or 20 pounds. Some brands also offer 5-pound weights which are meant for smaller increases. To select the required resistance, you need to pull the pin from the stack and slide it under the weight. Some leg extension machines come with a plate holder to hold the weighted plates. 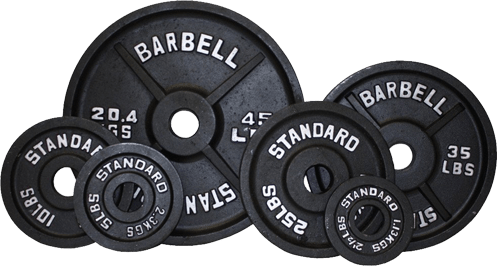 You are required to slide the required weights on the plate holder for resistance. 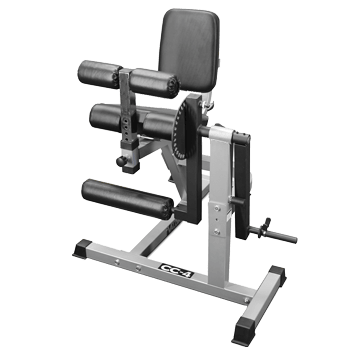 While it is simpler to switch weights on a selectorized leg extension machine, a plate loaded machine will offer several other weight options such as from .25-pound to 45-pound plates. Always opt for a seated leg extension machine that comes with lumbar support and a full comfortable seat. It must be suitable for beginners as well as be helpful for people with balance issues. Performing leg extensions with back support will ensure that there’s no undue stress placed on your lower back. It should also have handles on either side which will prevent your hips from slipping off the seat. It should be made up of high-quality materials to avoid the chance of injury from dropping the load. Your seated leg extension machine with chair must come with an adjustable ankle and seat pads that can be set for optimal comfort. The seat should be movable to suit users of different heights. To customize the machine to your requirements, sit down with your knees aligned with the axis of rotation. The seat must be adjusted to properly support your body while working out. Adjust the foot pad so that it sits just above the ankle. Are Leg extensions bad for knees? The most common belief regarding leg extensions is that they can be harmful if done incorrectly. But it is a good exercise to perform provided you take a few precautions. Do not overload weights and focus instead on the squeeze. Performing leg extensions with very heavy weights can increase your chances of sustaining a knee injury. If you feel a sharp pain at any time or hear knee clicking when performing this exercise, stop immediately and get it checked out. If you are recovering from any sort of injury, it's best to consult a doctor, personal trainer or physical therapist before adding leg extensions to your exercise routine. Since leg extension exercises apply constant pressure on the anterior cruciate ligament, people with ligament injuries should avoid this exercise completely, especially when using heavy weights. If these exercises are performed without proper form, there is also a small risk of lateral patellar deviation due to increased joint stress. It is of the utmost importance to maintain proper form when performing seated leg extensions. It’s also a good idea to add hamstring-strengthening exercises to your fitness routine in order to avoid muscle strain. When you strengthen your quadriceps without working on your hamstrings, there’s a greater risk of injury since your knee loses stability. Leg extensions should not be performed with excessively heavy weights since there is a lack of co-contraction between the hamstring and the quads. Since this is an isolation exercise, it causes injuries to the knee if done with heavy weights. It is recommended to maintain a 90-degree angle and lift the weight only half way instead of straightening your legs completely. It is essential to ensure that the axis of rotation of the knee is in line with the machine. The point of rotation for the machine should be adjusted taking the position of your knee joint into consideration. If the knee is placed too far behind or in front of the axis of rotation, this could cause serious issues due to the excessive stress placed on the joint. Sit with your back upright and point your toes to maintain optimal comfort and enhance the mind muscle connection. The leg extension machine is a great piece of equipment to start training your anterior leg muscles. The exercise targets your quadriceps, is simple and hard to get wrong. It is of the utmost importance to maintain proper form when performing leg extension exercises. Always position your knee at the correct height and avoid lifting excessive weights. Since it involves no other muscles, it is a good exercise to perform if you are trying to improve the force of your kicking movements and focus on your quads.